It continued to be made in Europe through the 1920's and 1930's; it was made in Australia in the 1930's; and in South America (Argentina) in the 1930's. Very little was made anywhere in the 1930's and 1940's. 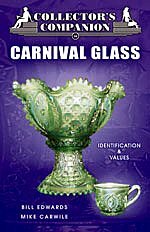 During the 1950's collectors became interested in Carnival Glass, so much so that it became economically worthwhile for glass manufacturers to start making it again, specifically for collectors.